A Catoosa County man is facing a handful of privacy invasion charges after he allegedly broke into a Ringgold residence and planted monitoring equipment, police say. Samuel David Townsend, 32, of 103 Parkview Drive in Ringgold, was arrested March 7 on charges of first-degree burglary, possession or sale of an eavesdropping device, unlawful eavesdropping, and Peeping Tom. He has been released from jail on bond. The acts Townsend is accused of were discovered March 5 when a Patty Road resident reported suspicious sounds coming from underneath her home. When a deputy arrived at the home, the victim said she was getting out of the shower when she heard a sound coming from the house's master bathroom. The woman claimed she initially thought a mouse was in the home, but that the noise got louder almost like something was being cut. A family member came over to assist the victim, at which time the duo discovered a white truck parked out on the street in front of the home and that the crawl space at the back of the house was open, reports show. The victim told Deputy Jonathan Viar that a neighbor reported seeing the same type truck in front of the residence weeks earlier. "The white truck had a 'Metro Services' sign on the side of it, which is a HVAC business," Deputy Viar said. "I noticed that the duct work in the bathroom had been cut." Sheriff Gary Sisk said Townsend did some work at the home in the past, and that he planted a recording device. Two days after the incident, on March 7, Townsend turned himself in at the Catoosa County Sheriff's Office and was interviewed by the detective working the case. Sheli Gilley says law enforcement has some misconceptions about House Bill 324. Zoe was living in a vegetative state, suffering up to 100 seizures a day, and on four medications. Cannabis oil changed it all for her. On March 5, Georgia House Bill 324, which would "provide for the production, manufacturing, and dispensing of low THC oil (also known as cannabis oil) in this state," passed the House by a vote of 123-40. 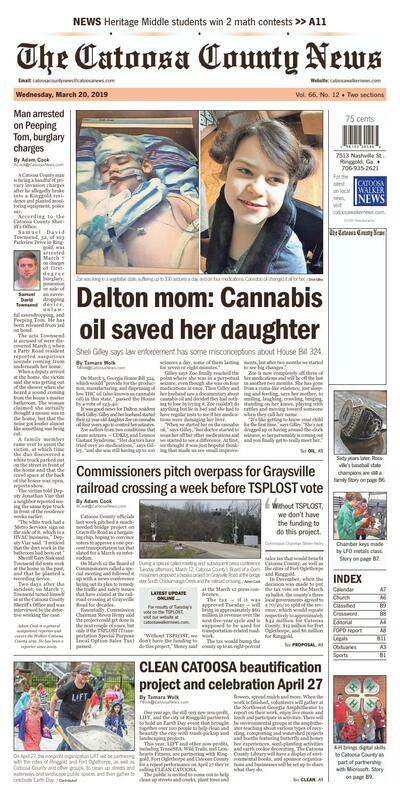 It was good news for Dalton resident Sheli Gilley. Gilley and her husband started their 12-year-old daughter Zoe on cannabis oil four years ago to control her seizures. Zoe suffers from two conditions that cause seizures — CDKL5 and Lennox Gastaut Syndrome. "Her doctors have tried over 20 medications," says Gilley, "and she was still having up to 100 seizures a day, some of them lasting for seven or eight minutes." Gilley says Zoe finally reached the point where she was in a perpetual seizure, even though she was on four medications at once. Then Gilley and her husband saw a documentary about cannabis oil and decided they had nothing to lose by trying it. Zoe couldn't do anything but lie in bed and she had to have regular tests to see if her medications were damaging her liver. "When we started her on the cannabis oil," says Gilley, "her doctor started to wean her off her other medications and we started to see a difference. At first, we thought it was just hopeful thinking that made us see small improvements, but after two months we started to see big changes." Zoe is now completely off three of her medications and will be off the last in another two months. She has gone from a coma-like existence, just sleeping and feeding, says her mother, to smiling, laughing, crawling, lunging, standing on her knees, playing with rattles and moving toward someone when they call her name. "It's like getting to know your child for the first time," says Gilley. "She's not drugged up or having around-the-clock seizures, so her personality is coming out and you finally get to really meet her." The Gilleys are on a list of individuals approved for the purchase of cannabis oil in Georgia, but they cannot buy the oil in the state, because it's against the law. "We order it online," says Gilley. "It's not covered by insurance, so it's out-of-pocket for us. It would help if we could buy it locally instead of always having to plan ahead to allow for delivery time. Sometimes money is tight and you try to wait until you absolutely need something to buy it." Gilley says that concerns that have been expressed by local law enforcement about the legalization of producing and dispensing cannabis oil are exaggerated or misplaced. "Cannabis oil has changed Zoe's life," says Gilley. Gilley says Zoe has a therapist who comes to the house and works with her on a computer using a program called Eagle Eyes. A camera is used to take a picture of Zoe's eyes and allow her to use them as a cursor on the screen. "Zoe has learned she can interact with the program and make choices. Sometimes she'll focus on that little red 'x' in the upper right corner of the screen and close it down. She's gone from living in a vegetative state most of her life to being able to make decisions and act on them." Tamara Wolk is a reporter for The Catoosa County News in Ringgold, Ga., and Walker County Messenger in LaFayette, Ga.
Catoosa County Sheriff Gary Sisk and Walker County Sheriff Steve Wilson, along with several other sheriffs in Northwest Georgia, held a news conference on March 4 to voice their concerns about House Bill 324. They worry that shops selling cannabis oil would clutter Northwest Georgia near the interstates and cause problems similar to the ones too many methadone clinics cause, drawing people from out of state and increasing crime. But Sheli Gilley says that the only people who could legally purchase the cannabis oil would be Georgia residents with special ID cards whose physicians have approved of the therapy. Gilley also dismisses concerns expressed by the multiple law enforcement personnel at the news conference that HB 324 would open the door to legalizing the recreational use of marijuana. She says the bill includes strict limitations and oversight. Gilley says she has talked to a number of legislators and they all support the measures in HB 324. One, she said, did not support the measures in the past but has changed his mind. The next step for the bill is a Senate vote, which Gilley thinks will be favorable. "Her doctors have tried over 20 medications and she was still having up to 100 seizures a day, some of them lasting for seven or eight minutes. ... We started her on the cannabis oil. ... After two months we started to see big changes. During a special called meeting and subsequent press conference Tuesday afternoon, March 12, Catoosa County's Board of a Commissioners proposed a bypass project on Graysville Road at the bridge over South Chickamauga Creek and the railroad crossing. The March 19 TSPLOST vote has been a hotly debated topic since late last year when Catoosa County and the cities began discussing proposing it. Signs for both sides of the vote can be seen throughout the county and along Graysville Road. Catoosa County officials last week pitched a much-needed bridge project on Graysville Road as a bargaining chip, hoping to convince voters to approve a one-percent transportation tax that slated for a March 19 referendum. On March 12 the Board of Commissioners called a special meeting and followed it up with a news conference laying out its plan to remedy the traffic and safety issues that have existed at the railroad crossing at Graysville Road for decades. Essentially, Commission Chairman Steven Henry said the project could get done in the next couple of years, but only if the TSPLOST (Transportation Special Purpose Local Option Sales Tax) passed. "Without TSPLOST, we don't have the funding to do this project," Henry said at the March 12 press conference. The tax — if it was approved Tuesday — will bring in approximately $60 million in revenue over the next five-year cycle and is supposed to be used for transportation-related roadwork. The tax would bump the county up to an eight-percent sales tax that would benefit Catoosa County, as well as the cities of Fort Oglethorpe and Ringgold. In December, when the decision was made to put the tax vote on the March 19 ballot, the county's three local governments agreed to a 70/20/10 split of the revenue, which would equate respectively to approximately $42 million for Catoosa County, $12 million for Fort Oglethorpe, and $6 million for Ringgold. Without TSPLOST, we don't have the funding to do this project. For results of Tuesday's vote on the TSPLOST, visit our website at catoosawalkernews.com. In recent weeks, residents showed up to public meetings held by all three local governments voicing their opinions on the tax. At the March 12 news conference commissioners said the bypass project would cost roughly $12 million and could take possibly three years to construct. Residents have complained about the issues at the railroad tracks for years due to the railroad crossing creating traffic backups for a route that is usually a go-to roadway from Catoosa County to Chattanooga in lieu of taking I-75. Trains can hold up traffic at the crossing for 15 minutes to more than an hour. Schools Superintendent Denia Reese and Sheriff Gary Sisk spoke in favor of the project during the news conference. Reese pointed out how often school buses have to cross those tracks while transporting students. Sisk pointed out that traffic delays in that area have been known to hinder his officers when they try to respond to calls. Some residents are irked because they feel the timing of the proposed project coincides with the pending vote. "They haven't said anything about this tax going toward fixing that area, but now they're selling that to us a week before the vote," resident Willie Benson said after the news conference. "It just seems a little desperate to me. We all know that's been a problem area forever. Now they're using that to try to get the tax approved." On Feb. 19, the board hired American Consulting Professionals LLC at a cost of $14,500 to conduct a multistage feasibility study on the bridge and railroad to see what could be done. Chairman Henry said last week that if the tax is approved, the county would jump right back into engineering on the project the day after the vote. On April 27, the nonprofit organization LIFT will be partnering with the cities of Ringgold and Fort Oglethorpe, as well as Catoosa County and other groups, to clean up streets and waterways and landscape public spaces and then gather to celebrate Earth Day. One year ago, the still very new non-profit, LIFT, and the city of Ringgold partnered to hold an Earth Day event that brought together over 100 people to help clean and beautify the city with trash-pickup and landscaping projects. This year, LIFT and other non-profits, including TenneSEA, Wild Trails, and Lionhearts Fitness, are partnering with Ringgold, Fort Oglethorpe and Catoosa County for a repeat performance on April 27 they're calling CLEAN CATOOSA. The public is invited to come out to help clean up streets and creeks, plant trees and flowers, spread mulch and more. When the work is finished, volunteers will gather at the Northwest Georgia Amphitheater to report on their work, enjoy live music and lunch and participate in activities. There will be environmental groups at the amphitheater teaching about various types of recycling, composting and watershed projects and booths featuring butterfly and honey bee experiences, seed-planting activities and earth cookie decorating. The Catoosa County Library will have a display of environmental books, and sponsor organizations and businesses will be set up to share what they do. "This event is about service and community," says Ringgold Mayor Nick Millwood, who participated last year. "LIFT is one of the best at promoting both of those things. We're excited to grow this event this year to include Fort Oglethorpe and Catoosa County and show the next generation the things we can do when we come together." Ringgold City Manager Dan Wright also participated last year. "A new project we have planned," he says, "is a wildflower garden along some of the nature trails. It will add color to the trails and reduce the amount of mowing needed." Wright also says that planting trees along South Chickamauga Creek will assist in stream bank stabilization by guarding against erosion and will provide shade and lower the water temperature in the summer, which will promote a healthy aquatic population. "We still need to replace some of the trees lost in the 2011 tornado," he says. In addition to on-land projects, local residents who have kayaks, canoes or paddle boards — and life vests — are invited to sign up for a waterway team and help clean up local creeks. "Our water is a shared resource," says TenneSEA Executive Director Mary Beth Sutton. "Everyone uses it and has a personal responsibility for taking care of it. We hope by connecting people through these clean-up efforts we will encourage long-term stewardship of our waterways." "The biggest benefit from last year," says Wright, "was the camaraderie of over 100 people working in the rain. No one complained. To see adults working alongside children and youth that they didn't even know was great. It built community." Where: Throughout Ringgold, Fort Oglethorpe and Catoosa County, gathering afterward at the Northwest Amphitheater at 220 Catoosa Circle, Ringgold. Needed: Volunteers to help clean and landscape various areas, team leaders, event and activity sponsors, business sponsors. Kick-off meeting: March 26 at 7 p.m. at the Graysville Voting Precinct, 967 Graysville Road, Ringgold.